"I remember there was a lot of buzz. No one was really thinking he would play. He didn't fly in with the team, and we weren't sure if he was playing. There was a huge buzz in the arena when he got out there that he came back. That was the old Spectrum." "Philadelphia was as appreciative of any place I've ever been that day to watch him come back and play. They responded and it was a moving moment in the world of hockey. Everybody was caught up by it. It was such a great response. 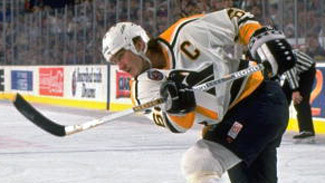 The crowd was just like, 'Wait, Lemieux is playing?' and then they were happy to welcome him back after what he had gone through. It was an amazing moment, to be there and see him play." "He wasn't going to play but he came out for warm-up, and then it's in Philadelphia and they cheered him every shift … and then he just lit us up. … I just remember that we [skated] around, we wouldn't touch him. We didn't want to hit him. We didn't want to play hard against him and he just lit us up." "I also played in his so-called last game. We knocked the Penguins out of the playoffs [in 1997] and that was supposed to be his last game. Then he came back again anyway. I've been in a few of these types of games with him. There is such a buzz in games like that with guys like him and Gretzky. It doesn't matter if they sneeze on somebody or whatever they do -- it is big news. You almost want it to be you. If you get burned, you don't mind if it is that guy in that game." "Their team, it was a clinic on how to play, and they had a great team. We were a young, struggling team. But that's the first time anybody from Pittsburgh has ever got cheered [in Philadelphia] unless they're hurt. The animosity between the two organizations on the ice is pretty strong, as you can see now. And it was really strong back there, but he got cheered every time he touched the puck, every time he got an assist or goal, people went crazy for him. He was very appreciative of it." "It was like nothing. It was almost like, 'Really? You've been out this long and you're still that good?' I just remember going, 'You've got to be kidding.' I just remember the buzz. It was a different game. "He didn't exert a lot of energy. I remember he just kind of did his thing and it was amazing that he could still just dominate considering the position he was in." "Mario was Mario. It wasn't the first comeback and it wasn't the last in his storied career. I guess we really shouldn't have expected any less." "It was so typical of Mario. He scored in those moments of being on the grandest stage. This wasn't the Stanley Cup Final or the All-Star Game, but it was a pretty unique stage and he always, always delivered on them." "I remember the night he came back. We were in Philadelphia and he scored a goal and the Philly fans gave him standing ovation. I don't think that's ever happened to a Pittsburgh player there before or since. But you could see the respect and admiration all hockey fans had." "I think it's amazing. I don't remember how long he was away from the game, but when he came back, I know he had a goal and an assist in Philadelphia. That's pretty good for being away from the game that long. Coming to Philly, I remember they cheered him there. I don't know how often that happens. That was a pretty cool thing. Anytime you see someone like Mario in that situation, I'm sure he inspired a lot of people." "I remember the day he came back. He didn't play for a month. He didn't skate for a month. He had the last treatment in the morning and he took a flight and came to Philadelphia. He played like he never had it. He had two points. I think he scored a goal. I think he played two games at home after that and he scored four goals both nights [March 18 and 20 against Washington and Philadelphia]. That's impressive, back-to-back four goals. That's why I think he was the most talented player ever. Wayne [Gretzky] was there, of course, but he didn't have to go through this." "I'm known as a Flyer, but I also love Pittsburgh, and for me that was one of the proudest moments for me as a guy who has lived in Philly for 20 years. They have been known as a tough fan base and when they gave him a standing ovation, I think we all on the bench got a little teary-eyed and he got a little teary-eyed." "When you get a Philadelphia crowd to stand and cheer for Mario Lemieux and the Penguins, certainly it is [one of the great games of my career]. That's never happened before and it will probably never happen again. It was an incredible, special moment in hockey lore. You just have to know it, that rivalry and what it means to people, but on this particular day I was so moved by the people of Philadelphia, seriously, by their warmth and the humanity that we can all have. I think deep down what we go through, outside the game of hockey, the experiences and the hardships -- it was a moving thing. It was part of an aura, if you will, of what we go through, and I was duly moved to be there that night and I think everyone else was, too, including the Penguins' organization and Mario. Everyone was moved that day."